Air Serbia has taken delivery of its first wide-bodied aircraft, ahead of the launch of flights to the US next month. The Airbus A330 is configured with 18 seats in business class and 236 in economy, with features including individual IFE systems with films in Serbian and English, “lie-flat seats” in business class, and a new dine on-demand service for premium passengers. Air Serbia is 49 per cent owned by Etihad Airways, and the aircraft will now fly to Abu Dhabi for “the final outfitting of its interior cabins”. The carrier will operate a five times-weekly route between Belgrade and New York from June 23, the first direct air service between Serbia and the US for 24 years. 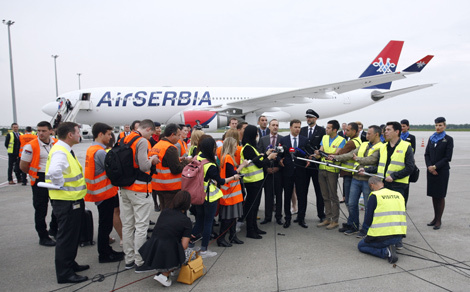 The new A330 is part of a re-fleeting programme which has also seen ten new narrow-body aircraft delivered to Air Serbia over the last two years.